Mesonet's 125 station sites will be identified and operational by 2016. 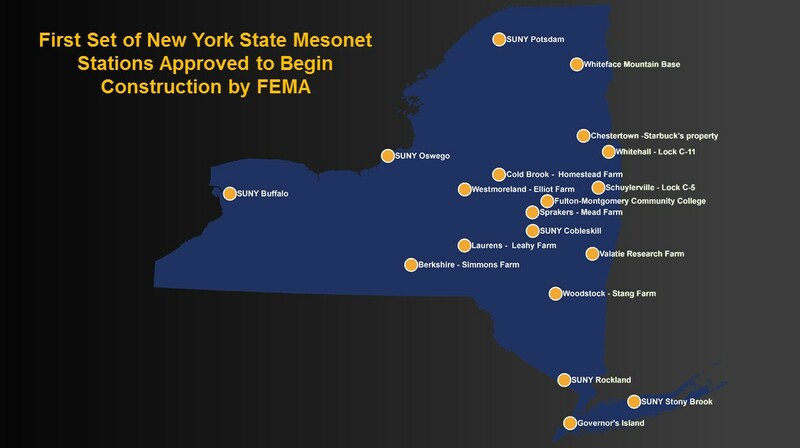 More information about New York State’s mesonet early warning detection system is available at http://nysmesonet.org. The Federal Emergency Management Administration has granted the construction and installation of mesonet weather stations in the first set of 19 locations below. A map of the locations is available here. Congressman Richard Hanna said, "I am pleased that our first responders and our residents will have all the resources possible to alert them when severe weather and flooding is on the way. Upstate New York has seen intense flooding over the past few years and this will be one extra measure to help keep our neighbors safe." Governor Cuomo announced the creation of the mesonet system in January 2014 with Vice President Joseph Biden. The project, entirely paid for through FEMA’s Hazard Mitigation Grant Program, will cost approximately $23.6 million. These FEMA grants are intended for projects that better protect life and property and enhance preparedness efforts in the event of future disasters. DHSES and its four offices – Counter Terrorism, Emergency Management, Fire Prevention and Control, and Interoperable and Emergency Communications – provide leadership, coordination and support for efforts to prevent, protect against, prepare for, respond to, and recover from terrorism and other man-made and natural disasters, threats, fires and other emergencies. For more information, visit the DHSES Facebook page, follow@NYSDHSES on Twitter, or visit dhses.ny.gov.